One of my favorite sources of inspiration for hair styling and makeup are past eras. Recently I found a fantastic wig and decided it would be the perfect prop for a 1920s inspired look. It got me in the mood to share. 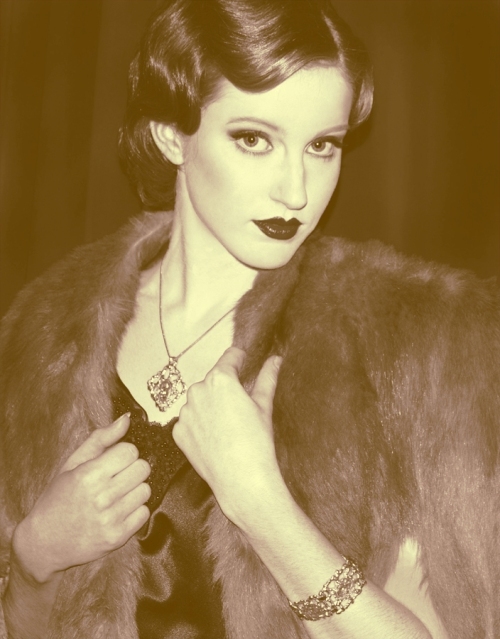 Here are my 1920s hair and makeup tips, I hope you enjoy them. My model had quite long hair, so the way I styled it for my 1920s look was by tucking the bottom half up into a bob and pinning it underneath, I left the top section out and curled it with a large curling tong, moulding and pinning each crest in place as I went. This created a water wave style which I then heavily sprayed and pinned the ends underneath to secure. To create the straight look bob I used my fantastic wig which I accessorized with a 1920s head scarf. The 1920s saw a broad range of hairstyles. Firstly the bob, then the shingle, followed by the "Eton Crop". For the eyeshadow I applied Peacock by Bobbi Brown heavily on the mobile lid, softly blending it out and lightly smudging it under the bottom lash line. I contoured the socket with Black Tied by Mac and used Black Track Fluid Line by Mac along the top lash line for definition. I opted to leave the waterline clean to compliment her pale skin and hair. Lastly I applied mascara, mascara and more mascara and let's not forget the lashes. The first eyelash curler that hit the market was mascara in a cake form and it was huge. Poison green, black and turquoise were common colours worn on the eye. I softly swept on Pinch o' Peach by Mac. Blush in the 1920s was applied on the apples of the cheeks and rarely blended. I exaggerated the peaks of top lip with Kryolan's Lip Pencil 910 (a rich red) and lined the bottom lip by filling out the sides to create a fuller bottom lip. I filled the lip in with Mac Ruby Woo and used a touch of Mac Russian Red gloss. Everyone wanted the Clara Bow lips. Clara was a famous silent movie star commonly known as the "It Girl". Max Factor Formulated Lip Gloss and metal tubes for lipsticks were introduced. Popular colours for lipstick were red, dark burgundy and maroon. Lipstick was soap based and the cost of a lipstick in the 1920s was 10 cents. What a bargain! A big thanks to Natasha Robertson for her amazing photographs and styling, Deanna for her exceptional modelling and the Dragonfly Bar on Victoria Square for their gorgeous venue.